The Wisconsin independent record label Spiritone has just released its fourth compilation album One on One. Like previous releases in the series, One on One promotes Wisconsin artists and includes area musicians and others with a strong tie to Wisconsin . You will likely recognize the established names like Don Conoscenti, Ralston Bowles, Tracy Jane Comer, Kenn Fox, Bill Camplin and Randy Green. A surprise appearance by west coast legend Simon Stokes and a collection of newcomers make this release rich with artistry and diversity. 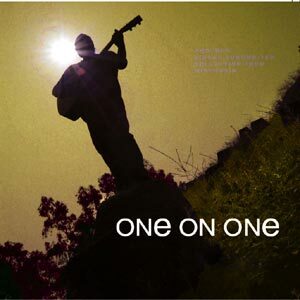 One on One opens with Ralston Bowles’ outstanding songcraft. As the tracks progress, the emotional thread moves from heart to humor and back before transitioning to stark expression. The album closes with Mare Edstrom’s breathtaking, introspective “I”. One on One is approachable and beautiful yet takes risks with relevant commentary on our times. The music on this album is in a “one on one” format - one singer/one instrument. Duo Fred & Ethel extend the format slightly offering only voice – one Fred/one Ethel. The songwriting is all original. Every track on One on One is an original recording which has not been released on other albums. A few of the songs can be found elsewhere, but in completely different versions. The folk influence is predominant as is the all acoustic vibe. Kenn Fox is the man behind the Wisconsin-based Spiritone Records and the producer of One on One. On the eve of the new release, we caught up with Kenn to get some insight on his latest project. Many of the artists showcased on One on One are returning from the previous Wisconsin Collections albums, but there are several newcomers on One on One. Are there highlights from these new artist's work that you would like to point out? Thematically this album runs the range from social consciousness and political concerns to love and introspection. When you approached the artists to participate on the project, did you have this sort of mosaic in mind? This is your fourth release in the Wisconsin Collections series. How is this one different? One on One and the other Wisconsin Collections CDs are available directly from Spiritone Records and from select area independent record stores. A release concert is being organized, to be held at the Café Carpe in Fort Atkinson and featuring many of the Spiritone artists. Details on that and other Spiritone news are available online at www.kennfox.com .